This manual wheelchair enables seated and standing mobility. There are about 1.7 million Americans that rely on a wheelchair or scooter for mobility. 90% of the people on a wheelchair use a manual device; only allowing for mobility while in a sitting position. Although electric wheelchairs give room for moving while standing or sitting, these devices are often too expensive for the average consumer. The novel manual standing wheelchair from the Shirley Ryan AbilityLab is an affordable option that gives users the ability to stand and move about while on the wheelchair. The manual standing wheelchair has all the ergonomic features expected of a wheelchair. It comes with a soft cushion as well as a backrest that affords the users maximum comfort. The wheelchair’s ergonomics is extended to the smooth hand drive that makes it easy for users to propel the device. This minimizes the risk of a shoulder injury; a common occurrence among manual wheelchair users. The hand-drive mechanism facilitates smooth propelling of the wheelchair while requiring minimal effort on the part of the user. Asides the smooth movement features, the wheelchair enables the users to stand upright for as long as they can. The same hand-drive mechanism is responsible for lifting the users into a standing position. Once they get to the desired height, users can lock the propeller into place and further wheeling of the hand-drive mechanism would help them move about. This innovative device from the Shirley Ryan AbilityLab is the first manual wheelchair that allows for mobility in the sitting and standing positions. To guarantee safety and security, the wheelchair comes with a lap belt and knee restraint that ensures users are fastened to the device at all times, whether during standing, semi-standing or sitting positions. There are also anti-tip wheels that deploy whenever the user propels the wheelchair into a standing position. Who’s the wheelchair meant for? 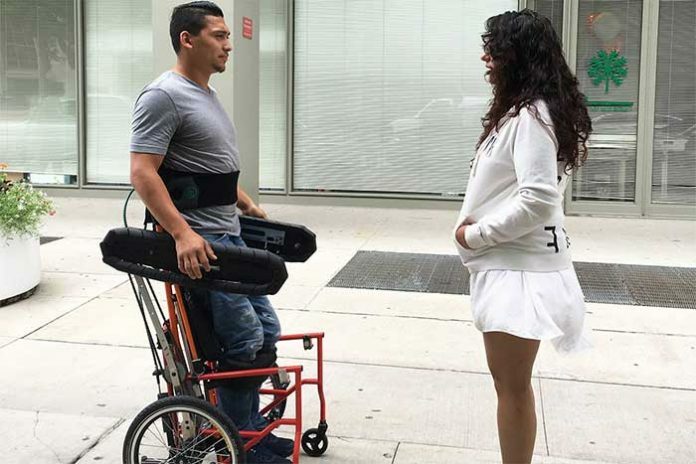 Any of the 1.7 million Americans that require a mobility device can benefit from this unique wheelchair. For most of us, simple acts like picking up an item from the grocery store shelf, looking our coworkers in the eye and reaching for items on overhead cabinets are taken for granted. However, many people that are confined to a wheelchair have to enlist help to do these. This device from the Shirley Ryan AbilityLab could be a life-changer for these people. The main target of the manufacturers are people with mobility-limiting conditions such as spina bifida, multiple sclerosis, spinal cord injury, and cerebral palsy. The wheelchair is yet to be released for purchase by the general public. The company received some form of grant from the National Institute on Disability, Independent Living, and Rehabilitation Research. It is hoped that the device would be made available to the general public soon. You can visit the official website of the Shirley Ryan AbilityLab for more information. I stay in South Africa and am very interested in your manual wheelchair to manufacture in South Africa and would appreciate any assistance even if i have to fly to America to meet with you.